There's never been a better time to be a nerd. Computer geeks run the world, math rock is a thing, and even thick black glasses are cool. So a novel that celebrates all things nerdy is welcome, even better when it is genuinely funny. Our hero is Gabe, a geeky ten-year-old who gets a stepbrother his age about a week before he heads off to the Summer Center for Gifted Achievement. Gabe is thrilled about both, but when he meets Zack, who surfs and spends most of his time on his iPhone, he begins to see himself through new eyes. True to his nature, he hypothesizes that he is not just a nerd who only has nerdy adventures, and decides to spend his time at camp working it out. What won me over about Gabe, as well as his bunkmates Wesley and Nikhil, is their total enthusiasm for everything. As a teacher, I can't imagine anything better than a group of adolescents who are excited and curious about all the possibilities they are offered (although I did snort knowingly when a lice epidemic is announced and a student asks for the genus and species. I teach Gifted and Talented classes.) For example, the boys try to make their cabin cooler, so they decorate with the theme of music and sports. Of course, the end up with pictures of Beethoven, a treble and bass clef, and the official rules of badminton. It's one of those moments that here in the south, you would shake your head and say, "Bless." That's the best part of Nerd Camp. Author Elissa Brent Weissman never denies the nerdiness of all the characters, but she always makes them more endearing than they are dorky. I'm happy that they have a safe place to love whatever it is you love, without fear of ridicule. 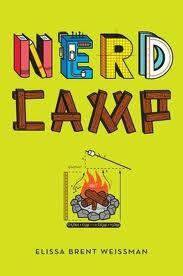 We all deserve our own version of a nerd camp. Yes, my kingdom for a class full of enthusiastic nerds!